A first church was built in Holdhus before 1306. This medieval stave church was replaced by a new timber-framed church in 1726 which could seat ninety churchgoers. A small tower on the west side holds the original medieval bell. When a new, larger church was built in the vicinity in 1890, the old building was purchased by Fortidsminneforeningen (Society for the Preservation of Ancient Norwegian Monuments). Above the entrance to the chancel is a remarkable sandstone statue of the Virgin and Child from c. 1450. 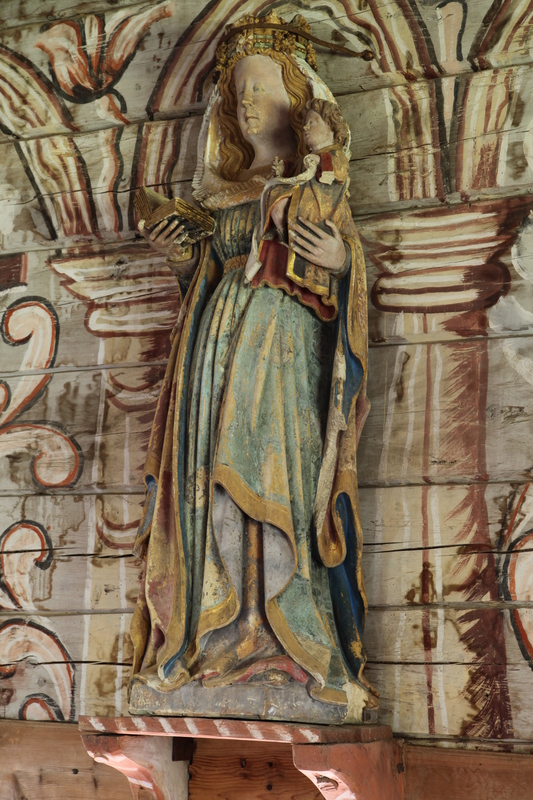 It is the only painted medieval stone sculpture in Norway. The pulpit dates from 1570, making it one of the oldest in Norway, while the tester was added around 1850. On the altar in the chancel is a nineteenth-century altarpiece. Its predecessor, a so-called katekismustavle (‘catechism panel’) from 1590 hangs on the wall on the north side. This is a text triptych typical for the second half of the sixteenth century, when Jens Pedersen Skjelderup, bishop of Bergen from 1557-1582, implemented a strong anti-image policy. In the nave hangs a ship model and the walls of the nave were entirely painted around 1800 in the ‘rosepainting’-style (rosemåling) showing vines and flowers.